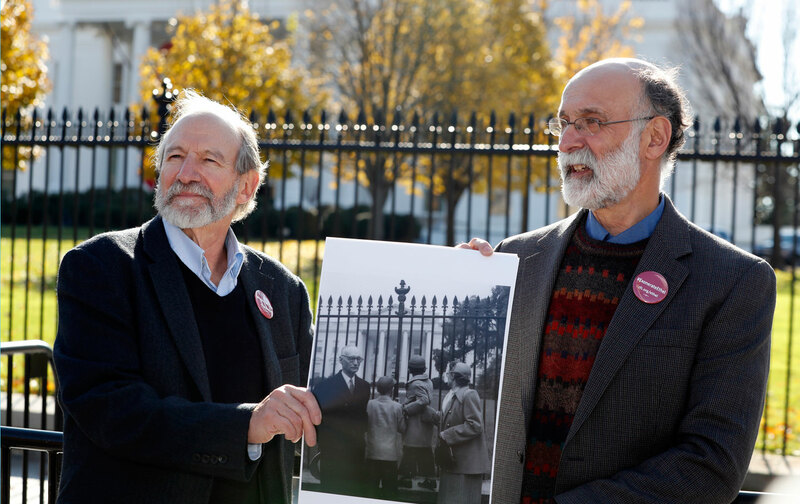 Last month the sons of Ethel and Julius Rosenberg, now balding men of 73 and 69, stood outside the gates of the White House. The first time they stood there, in June 1953, Michael was 10, Robert 6, and the man in the White House was Dwight Eisenhower. Their parents were scheduled to die in a few days, and the boys had come with their paternal grandmother to beg the president to spare their lives. Now, in the final weeks of the Obama administration, Michael and Robert Meeropol (their adopted name) had returned to ask the president to exonerate Ethel. For although the sons have come to accept that their father committed espionage on behalf of the Soviet Union during World War II, they are convinced that their mother was not a spy. “We are giving the United States government the chance…to acknowledge the terrible wrong it did to her and to us,” Robert told reporters. In support of their request, the Meeropols submitted a petition with over 40,000 signatures collected by the Rosenberg Fund for Children, an organization founded by Robert. They also delivered to the White House copies of testimony given to a federal grand jury in 1950 by Ethel’s brother David Greenglass and David’s wife, Ruth. The grand-jury minutes, which were not fully available until 2015, have added to the growing body of evidence that David and Ruth—the only witnesses against Ethel—lied about her role in the espionage conspiracy. The Seton Hall report uses pretrial documents and trial testimony to show how—and why—J. Edgar Hoover’s FBI, the US Justice Department, and a team of US Attorneys from the Southern District of New York (one of whom was Roy Cohn) targeted Ethel and pursued her to her death. Most of the pretrial documents it cites are not new, but were obtained decades after the trial through a protracted Freedom of Information lawsuit filed by the Meeropols, and were evaluated in 1983 in an expanded edition of Invitation to an Inquest, a study of the case Walter Schneir and I coauthored. But by focusing solely on Ethel, the report lays bare the injustice visited upon her by high officials of the federal judiciary. In Ruth’s initial statement incriminating Ethel, which she signed on July 14, Ruth alleged that Julius had asked her in 1944 to help recruit David as a spy, and Ethel had seconded his request. On July 17, the date of the FBI memo initiating the “lever” strategy, Ruth signed a new FBI statement expanding Ethel’s involvement. She now claimed that Ethel had been present in January 1945 when David and Julius prepared a recognition device (a torn piece of a Jell-O box) for a future espionage rendezvous. David quickly corroborated Ruth’s July statements, and Ethel was taken into custody on August 11, 1950, less than a month after Julius’s arrest. She remained behind bars for the rest of her life, insisting to the last that she was not guilty. Her sons meanwhile were set adrift on a three-year odyssey that took them from their maternal grandmother, to a Bronx children’s shelter, to their paternal grandmother, to a sympathetic New Jersey couple, to a residential school in Pleasantville, New York, and finally to the home of loving adoptive parents. In early 1951 Assistant United States Attorney Myles Lane, who was part of the prosecuting team in New York, came to Washington to testify before the Joint Congressional Committee on Atomic Energy. He explained to the assembled senators and congressmen that it was important to get Julius to cooperate because he was “the keystone to a lot of other potential espionage agents.” Lane conceded that “the case is not too strong against [Ethel],” but if she was given “a stiff sentence of 25 or 30 years,” Julius might be persuaded to talk. This Alice in Wonderland scenario—“Sentence first verdict afterwards”—was especially bizarre because the only evidence linking Ethel to the conspiracy at this late date was still Ruth’s July statements.